Of the three Detroit Public School League teams still unbeaten through week four of the football season, Mumford High is the one that has forged the biggest reversal of fortunes. Coach Donshell English’s Mustangs are 4-0 overall and 3-0 in the PSL West entering Friday’s 4 p.m. game at winless Ford (0-4 overall, 0-3 PSL West). Barring an upset of major proportions, Mumford will continue its turnaround after finishing 0-5 in the league and 2-7 overall in 2012, English’s first season as coach. The PSL’s other two unbeatens are both no strangers to consistent winning. 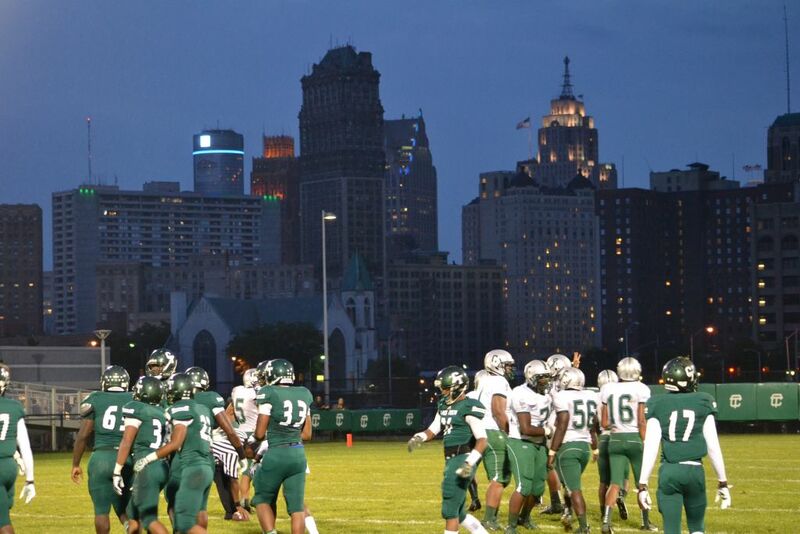 Defending league champion King (4-0 overall, 3-0 PSL East) is idle this week, while back-to-back defending Division 1 state champion Cass Tech (4-0 overall, 3-0 PSL West) hosts winless Central (0-4 overall, 0-3 PSL West) Friday at 4 p.m. In other games Friday, all 4 p.m., Cody (1-3 overall, 1-2 PSL West) is at Renaissance (2-2 overall, 2-1 PSL West); Western (2-2 overall, 1-2 PSL West) visits surprising DCP-Northwestern (3-1 overall, 2-1 PSL West); winless Southeastern (0-4 overall, 0-3 PSL East) visits surging East English Village (2-2 overall, 2-1 PSL East); Osborn (2-2 overall, 2-1 PSL East) is at Denby (3-1 overall, 1-1 PSL East); and winless Douglass (0-3 overall, 0-2 PSL East) visits Pershing (1-3 overall, 1-1 PSL East). In last Friday’s games, Cass Tech defeated Cody 30-6; East English Village shut out previously unbeaten Denby 22-0; King walloped Southeastern 44-2; Mumford routed Western 44-6; Osborn beat Douglass 12-0; Renaissance blanked Ford 34-0; DCP-Northwestern got past Central 20-6; and Pershing lost to nonleague foe Detroit Country Day 42-0.